Sometimes life can be annoyingly busy; too busy. His Nibs and I have been trying to arrange a night out with good friends for absolutely ages, and for one reason or another it’s not happened as quickly as any of us would like. 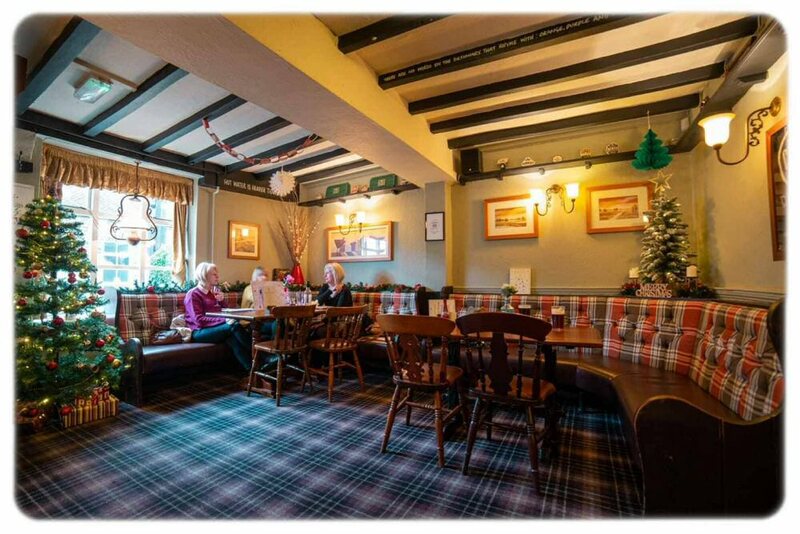 Finally we all managed to sort a date and agreed to meet at The Stanhope Arms down in Stanton-By-Dale. 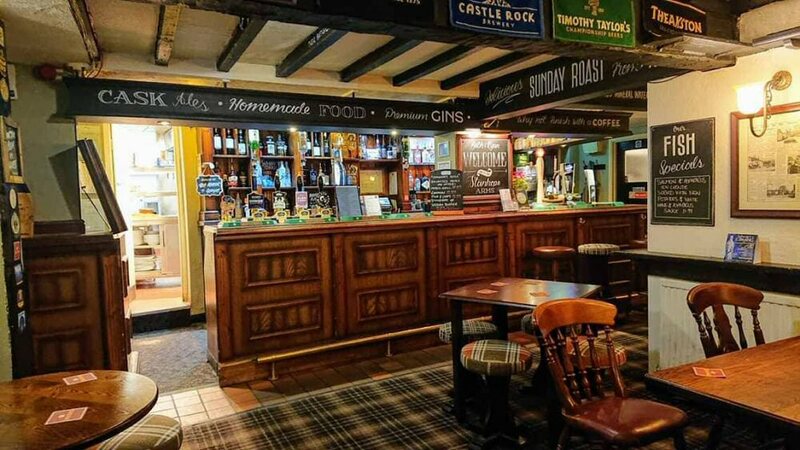 A few weeks ago The Man Bird and me visited another of the Pub People’s venues (The Red Lion at Bagthorpe) and had a cracking evening, so we were looking forward to seeing what The Stanhope Arms had to offer. Having never been before, we sailed straight past the car park, although in mitigation it is on the opposite side of the road to the pub itself! It wasn’t a hassle though as we managed to park on the road a few yards up from the venue. Traffic was surprisingly quiet for a Friday evening and we got there ahead of our friends so we headed to the bar for a drink before we went to the table. If you’re a Gin lover, you’ll be well impressed with the range on offer at The Stanhope Arms; I settled for a humble Hendrick’s and Mediterranean Tonic, and His Nibs had a pint of Estrella. Soon after, our friends arrived (Mr & Mrs Tree Hugger) and after the usual round of catching up we all turned our attentions to the menus and specials board. For starters the two chaps had the Famous Stanhope Scotch Egg and Homemade Crab Cakes – no prizes for guessing that The Man had gone for the Scotch Egg! Mrs Hugger and I had got our eyes on having a pudding so we passed on the starters (more time to slip in an extra cheeky Gin). Both starters came with a nice side salad that was glazed with a Honey Mustard dressing, just a little step up from a plain version – it’s often the small things that make a huge difference though isn’t it? 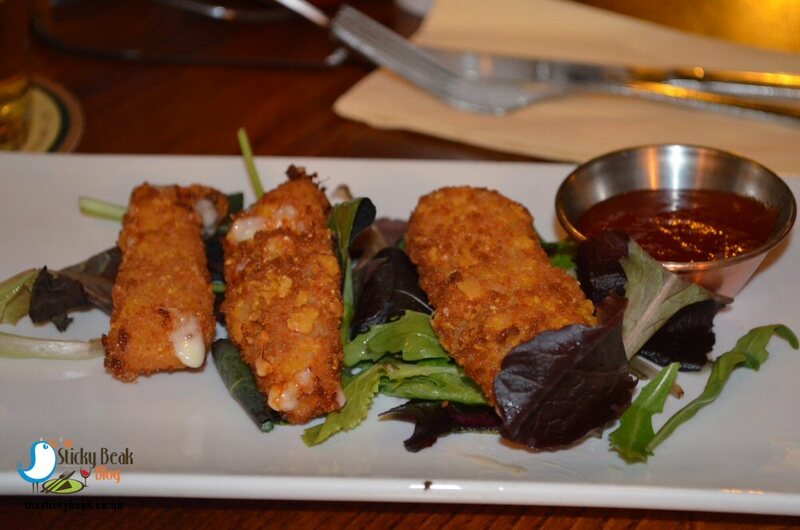 Tree Huggers Crab Cakes were a generous size, moist, and full of flavour which got his evening off to a flying start. He really liked the sweetness of the Mango salsa too, and the crunch of the Samphire fronds added a fab textural element to the dish. 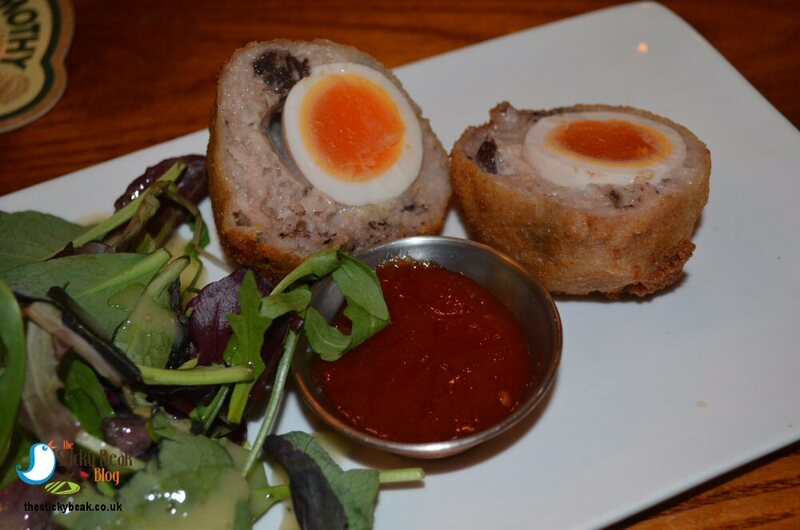 The Man Bird was chowing down on his Scotch Egg halves with his usual gusto, impressed with the thick layer of Black Pudding-enhanced sausage meat on the outer. A herbed breadcrumb outer had been fried to give it a gorgeous crunch when bitten into, and the egg itself had an incredibly rich, creamy yolk that was just gorgeous as it melted on the tongue. Sweet Chilli Jam was in a separate pot and added a little extra oomph in the mouth, although to be honest the Scotch Egg was so flavoursome in its own right that the additional punch wasn’t strictly necessary. 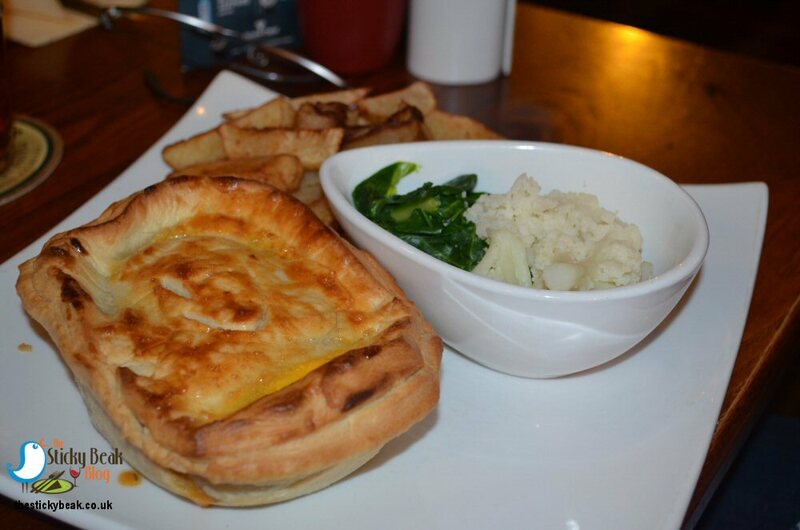 With it being National Pie Week, the Stanhope Arms had done a separate Pie menu comprised of a quartet of savoury pies and a sweet variety. Mr Tree Hugger fancied the Homemade Chicken Tikka pie and I liked the sound of the Homemade Steak and Kidney pie (I do like a bit of Offal every so often, but both The Man and Chick can’t stand it!). Mrs H had the Fish and Chips with Mushy Peas and His Nibs opted for the Stuffed Chicken. Due to the pies being cooked fresh-to-order there is a time wait of about 25 minutes for them to cook – more time for yapping and supping then. Both pies were invitingly golden on top and came with a good portion of chips (you can have other potato choices), Cauliflower and Cabbage, and a jug of gravy. Mr Hugger really liked his Tikka pie, it had a nicely rounded taste and wasn’t overly spicy heat-wise. There were plenty of chicken breast pieces contained in the sauce, so it was very filling; so filling in fact that there were chips going begging at the end. Let me just say that there were no chips going begging on my plate! 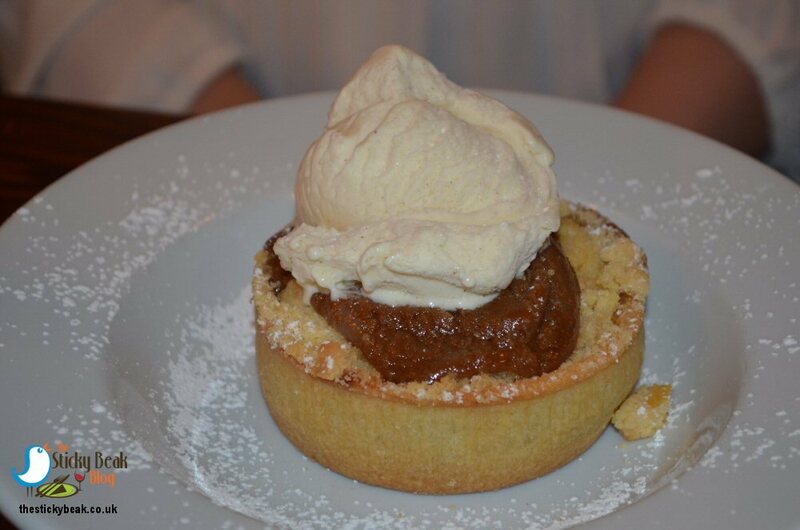 I was really impressed by the amount of filling in my choice of pie too; again it was a satiating dish. The steak was nice and tender with a lovely rich taste and the kidney was soft as well (nothing worse than tough offal) but luckily this wasn’t the case, and I enjoyed its deep taste too. On a personal note, the Cauli was a little too soft for me, but the Cabbage still had some firmness to it. Mrs H’s Fish was certainly a plate filler, and the rest of her meal fitted in underneath and around it! The fish itself was beautifully moist and had a lovely crispy beer batter coating that had a nice texture to it. 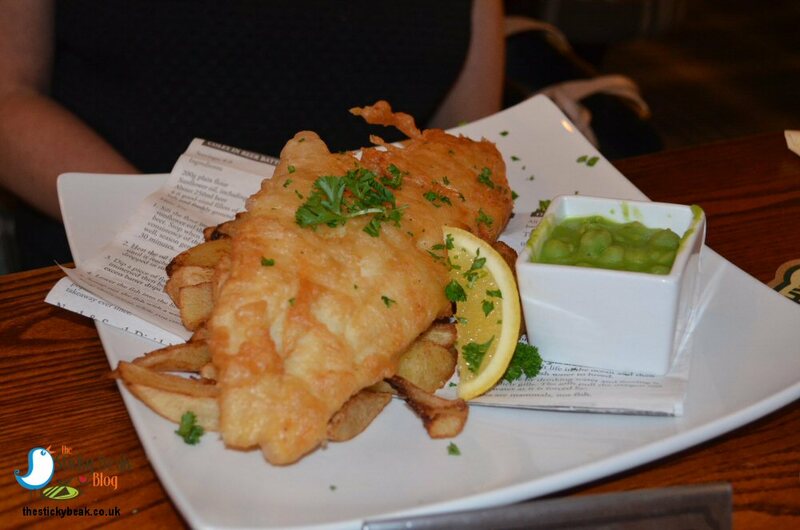 I don’t know about you, but I don’t like my Mushy Peas touching my fish or chips, so it was nice to see that they came in a separate bowl (as did the Tartare sauce). 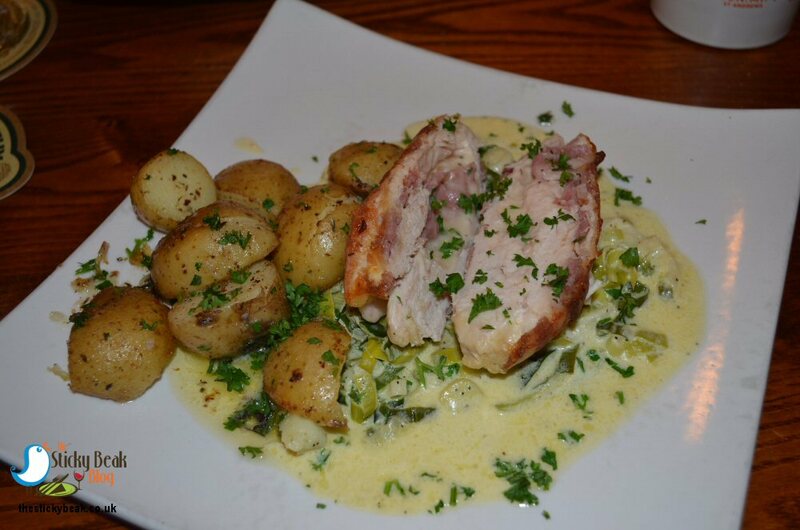 The Man Bird’s Stuffed Chicken was a proper whopper – good job he has a hearty appetite! Two cheeses, Cheddar ad Mozzarella, are stuffed inside the breast of Chicken and the whole thing is wrapped in Bacon before being popped in the oven to cook. Wrapping the Chicken definitely preserves its moisture, it was lovely and juicy, and it also makes the Bacon wonderfully crispy. Win-Win. The accompaniments to this dish are a little more imaginative than some places; herb-roasted Potatoes and Creamed Leeks. His Nibs really liked the herbed Potatoes; they were just crispy on the outside and the herb coating really popped on the palate. The creamed Leeks had the “wow factor” for him, with their gorgeously rich creamy sauce and just-firm Leeks giving a gentle oniony hint in the mouth. That’ll be another clean plate then! I should just mention the staff team at this point. Every single one of them was working hard (the venue was rammed with diners and drinkers alike), but nothing was too much trouble, and they didn’t rush the service they gave each person. Running the Stanhope Arms is a young couple, and they are doing a great job, let me say. Initially I was going to have the homemade Apple and Blackberry Pie with Custard for my pudding, but then I spotted the warm Caramel Apple Cobbler on the menu ad decided to give that a whirl instead. 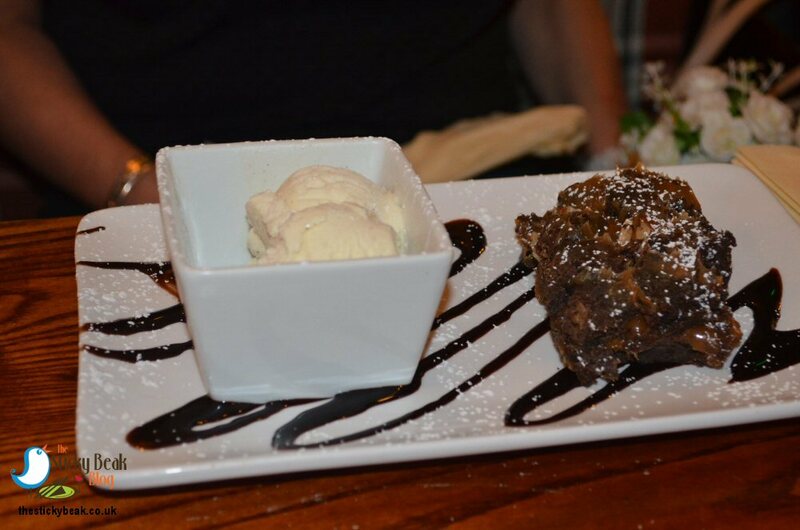 Both the men chose the Sticky Toffee Pudding with custard, and my fellow female companion had the Chocolate, Caramel and Pecan Brownie with Ice Cream from the specials board. 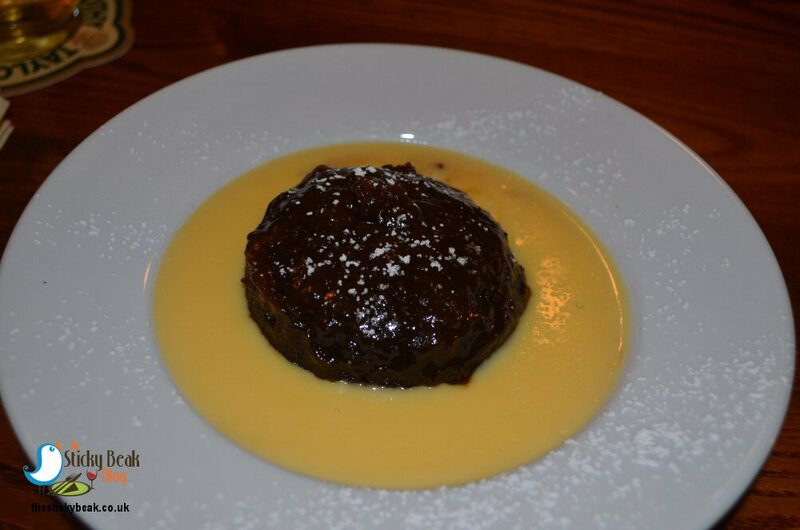 One thing’s for sure: you don’t need to ask for extra custard with your Sticky Toffee Pud, there was sunny lake around the deep brown pudding! The Man Bird and his pal both liked the richness of the toffee sauce and the dense-but-moist sponge of their dessert choice. It was piping hot and both of them were blowing on their spoons furiously for the first couple of minutes as they couldn’t be patient enough for it to cool naturally. Greedy monkeys! Mrs H had a bad case of eyes-bigger-than-belly, and despite giving it her best effort she didn’t manage to finish her Brownie. It was incredibly rich and satisfying, we all had a dib and thought the same; a third of a portion would still be filling. There was no disputing the deliciousness of it though; the Chocolate and Caramel components were gorgeous, and the Pecan nuts gave it a fab crunch. My Caramel Apple Cobbler was super, but I would’ve liked a bit more Apple in it to assuage its sweetness a little. At the end of a meal it was a smidge heavy on my tum, which was a shame because it really was superb in every other way. The Caramel was stunning in its consistency and flavour, and I loved the way it coated my mouth and lingered lovingly there for a few seconds. I was glad that it had come with Ice Cream rather than custard – not only for the lighter texture, but also the contrast in temperatures was most welcome. We all agreed that the food had been spot on in terms of quality, quantity and value for money; you don’t get much better than that, do you?! The starters had been £4.99 and £5.29 for the Crab Cakes and Scotch Egg respectively, mains had been £10.99 (with the exception of my pie at £11.99) and desserts were £4.99 (Sticky Toffee pud), £5.25 (my cobbler), and £3.99 for the Brownie on the specials board. Hot Wings happily given to the Stanhope Arms at Stanton-By-Dale I would advise booking a table at the weekends and for the Sunday Carvery, as it is a really popular venue (and deservedly so! ).